The relics of St Therese of the Child Jesus and her parents will be in Ireland for the World Meeting of Families 2018. The relics will travel throughout Ireland and will be brought to Galway Cathedral on Thursday 16 August and Loughresa the next day. A mass and liturgy of welcome will take place at 11am, followed by veneration of the relics from 12 noon until 10pm. On Friday August 17 a mass and ceremony of departure will take place at 7:30am. These relics will travel throughout Ireland before and after the meeting to enable people to connect with the congress and to make their own personal veneration of these saints. The Relics will be at the Opening Ceremony in the R.D.S., Dublin, on Tuesday, August 21, and they will also be in the sanctuary in the Phoenix Park for the Papal Mass on Sunday, August 26. More popularly known as ‘The Little Flower’, Marie Francoise-Thérèse was born in Alençon in France on January 2, 1873, and was the youngest child of Louis and Zélie, and was just 4 years old when her mother died. 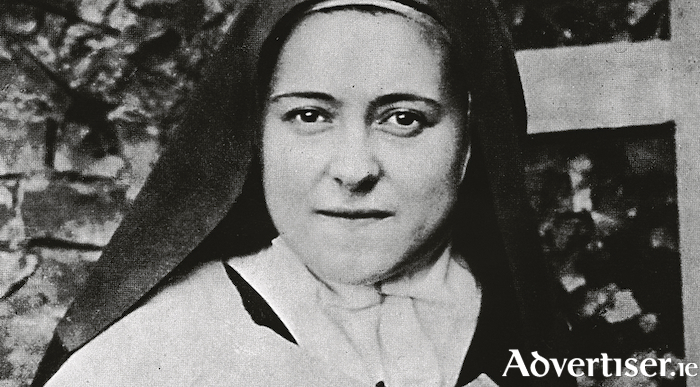 Whilst still young, and despite opposition, she entered the Carmelite Monastery of Lisieux at the age of 15, taking the name Sister Thérèse of the Child Jesus, and later adding ‘and of the Holy Face’. By word and example she taught the novices the virtues of humility. Following a difficult illness she died on September 30, 1897, and was canonized in 1925 with successive popes referring to her as ‘the greatest saint of modern times’. She became famous for her ‘Little Way’ which is found in her remaining letters and her biography. She was declared a Doctor of the Church by Pope John Paul II in 1997. She is co-patroness of the Missions and secondary patron of France.